In the present day scenario, the world can’t be imagined without mobiles. They have turned into the basic companion of every user in the world containing information of users and making communication and advancements easier. However, buying a mobile has become quite a difficult task nowadays as many companies have emerged with their own technology and price. Choosing a mobile from the tons of options in the market filled with lots of manufacturers, their uniqueness and specialty as well as prices that seem to be quite appealing in every aspect. Comparing a phone with other competitors is more difficult than going through their individual specifications and thus there are lots of reviewers outside to make money from their complete reviews on phones which we can see in YouTube as well as television. On the other hand advertisements and publicity stunts also makes the buyer confused due to their overwhelming presence in media. One of the toughest bases to compare mobile with other is their processors. Every specification of a mobile begins with the type of processor used in it. The second comes to its additional specification such as fingerprint sensor, camera quality, display quality etc. Apart from these technicalities, many mobiles also have emerged with the same processors such as Xiaomi, Oppo, and Vivo etc. Therefore the answer for the question “Which processor is best for mobile?” has become one of the essential points for every buyer due to the massive number of processor types in mobiles. But for concluding this question one needs to understand some basic aspects of processors. The processor is the thing that not only defines the quality of mobile but also decides which mobile is superior to which another competitor at the same price. It can be termed as the main system on the mobile that is specially designed to support application running and system running process. They are a system on chip which can manage and process the environment of mobile operating system based on the versions and supporting capability. Even camera quality, display quality, battery capability, processing speed, animation reliability etc also depend on the type and capability of the processors. Basically, the cores and slots of the chipset decide the quality, capability and feasibility of a processor and eventually the capability of the mobile. Categorization based on the core types are respectively dual-core, quad-core, and octa-core processors etc and as the number of core increases, quality, capability, and features also increased for a Smartphone. Processors such as mediate, Snapdragon etc are for the mid-range phones which also have powerful versions of them. On the other hand, Snapdragon 825 and higher versions of processor called as flagships models of the phone which are quite expensive. However, there are some processors such as Exynos from Samsung and bionic chipsets from iOS devices that have their individual capacity as well as independent prices based on the cost decided by the manufacturers. 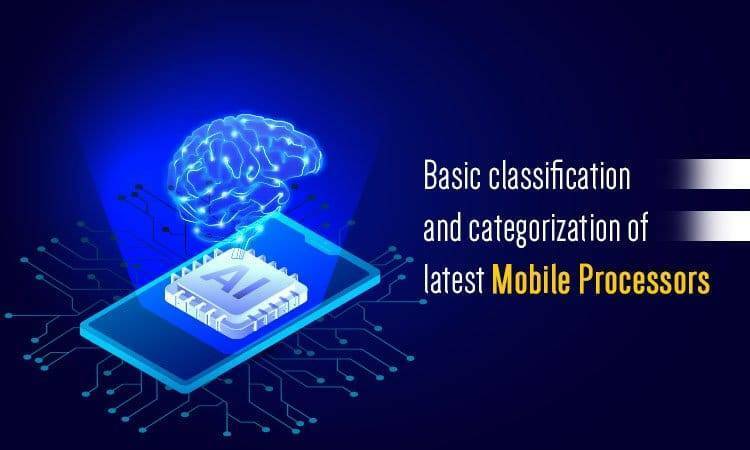 The whole mobile processor list of the mobiles can be classified in a few basic types and some of them are based on cores, based on the models, based on the brands and mainly the supporting features of the processors of which cores can play an important role in choosing the best processor. As the name points, they are the basic processor types in mobile with 2 cores in the processor. Both of those independent cores function together to process the instruction provided by the user and also including storage, capability, and productivity in the running system and application processes in the background as well as while in use. Quadcore: – It is the cheap processor in the mobile processor list, but the latest mobile processors also contain this in upgraded versions. This processor contains 4 independent cores that function together to support all functionalities to enhance the speed of processing the instructions provided by the users. The advanced feature of this processor, when compared to the dual-core processor, is that the 4 core function can also run multiple programs to simplify and enhance the user experience. Octa-core processor: – This processor is an advanced model of all processors and also the latest mobile processor possessing 8 independent cores that have the capability to deal with tasks far more easily and smoothly with less delay. Octa-core processors such as Snapdragon 430 can deal with the same task provided to Quadcore processor easily with more efficiency and productivity. The clock speed of octa-core processors is running between 1.7GHZ to 2GHz which means the multitasking, as well as rams management, can be made simpler and easier by the user. Apart from all these processors and the core functionalities, there are some other processors in different devices such as hexacore and decacore in Android as well as bionic chips in iOS devices. Most importantly iOS devices are the high-end versions of processors that are known for its incredible performance and extreme utilization form factors too. Finally the answer for the question “Which mobile processor is the best?” will be based on the price range or affordable qualities. If you can spend an inch of money in buying mobile devices then the A12 bionic chipset that is seen in phones are considered best with impeccable fluid performance and utmost incredible design and performance. If you are set to choose a processor from Android devices then you must have to go through versatile designs and qualities of the latest processor. Flagships such as Samsung Galaxy Note 9, Google pixel 3xl and one plus 6T etc have high-end processors that are guaranteed to have incredible features and flexible processing speed. If you can settle down with basic mid-range phones then there are many devices emerging with good processing speed every month, look out for an octa-core or quad-core processor with some renowned UI to have the value for money as well as satisfaction in performance.